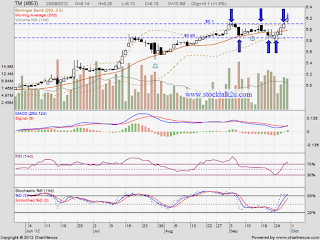 28 Spet 2012, TM succeed break through RM6.10 resistance level. Higher high & higher low been confirm, expecting will have another wave of uptrend. If retrace down, immediate support @ RM6.10 level. Subsequent support @ MA20 & MA50 strong support level.